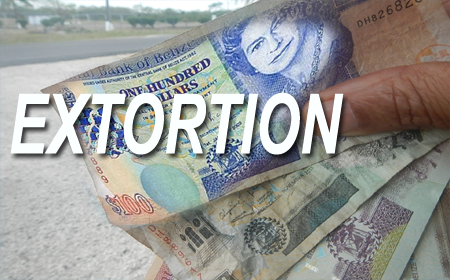 SAN PEDRO–In just over four months, three San Pedro police constables have been interdicted from duty on a charge of extortion. On July 24, Constable Elvin Nah of San Pedro police was arrested and charged with extortion and released on bail of $2,000 in the San Pedro Magistrate’s Court. On November 18, Constable Oscar Ramirez, also of San Pedro police, was charged and arraigned for extortion. Now Constable John Arana, another cop from San Pedro police, has been arrested and charged with extortion, for accepting $500 in extortion money from a businessman in San Pedro. Arana was taken to the San Pedro Magistrate’s Court today, Monday, where he was arraigned on a charge of extortion. He was offered bail of $3,000 and ordered to return to court on January 27, 2015. Arana allegedly only got $700 of the extortion money. San Pedro police, in a release issued on Saturday, December 13, said that “On 12.12.14 at about 11:40 a.m., police responded to an extortion in progress and visited Mamacita’s Entertainment Bar on Angel Coral Drive, San Pedro Town, where Police Constable John Arana was seen coming out from inside the bar. “He was approached and searched, where in a black leather wallet in his pocket were (10) $50 bills extorted from a businessman in San Pedro Town. He reported that John Arana told him that instead of going to court over bills owed to a supermarket, that he could make all this go away if he would pay him. The police release further stated, “On Friday, December 12, 2014, about 11:40 a.m., John Arana arrived at his place where he [the businessman] informed him [John Arana] that he did not have the full money to give him, but he could give him what he had. He then handed over to John Arana a white envelope which contained (10) $50 [bills on] which he had placed the marking ‘c.c’ on the left corner of each bill, and he had also photocopied them. “Police Constable John Arana was subsequently arrested and charged for the crime of extortion,” ended the police report. We were told that police, who had been alerted, were waiting for Arana, and as he walked out of the business, he was arrested. Constable John Arana has since been interdicted from duty and will be tried internally by the Police Department through a special police court called a police tribunal, which can impose penalties, including dismissal from the department, if the accused officer is found guilty of the offense. On July 24, another San Pedro police officer, Constable Elvin Nah, was charged with extorting $400 from a man, he had busted with drugs, to release him from custody without charges. The man allegedly handed over eight $50 notes to the cop and walked out from the station. Then on September 23, Constable Oscar Ramirez was arraigned in the San Pedro Magistrate’s Court on a charge of extortion, he was released on a bail of $3,000, and was suspended from duties. Police said that PC Ramirez accepted eight $50 bills as extortion money from the son of a woman, who was being detained at the San Pedro Police Station, to release her without charges for a vehicle insurance offense. The three policemen have therefore been interdicted from duties pending a police tribunal that will try them internally for breaches of police codes of conduct.